HPI Racing is proud to announce a new body: the 1/10th scale Baja TT. The Baja TT body comes as one of the standard bodies on the exciting new E-Savage line and now we have released this clear version that you can paint to suit your taste. 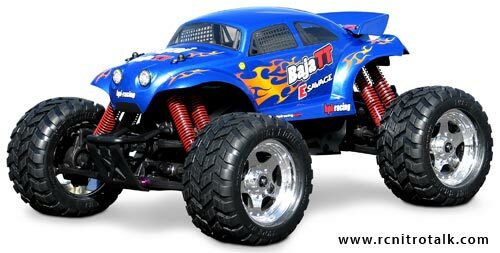 The Baja TT body is styled after the bodies that real off-roaders have been using with success for years, just scaled down for use with the basher you run in your own back yard! Included with the body is a large pre-cut decal sheet includes window lines, headlights, tail lights, HPI and Baja TT logos and much more, providing E-Savage owners with a realistic finished product. An overspray film is included, as well as vinyl window masks to make painting quick and simple. An instruction sheet is included for the decals, and the body has dimple marks for body post drill locations for blank bodies. This is a 1/10th scale body that will fit the HPI E-Savage and has markings for mounting directly to the HPI MT2 or Rush Evo. This body should fit most 1/10th scale stadium trucks with very little modification. 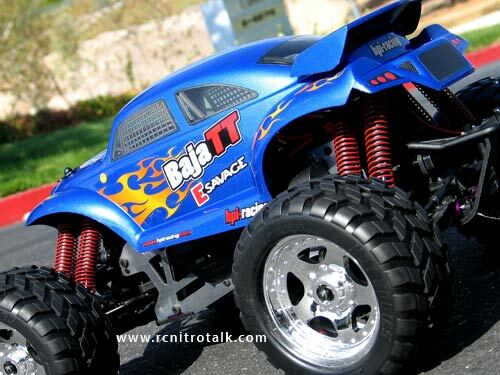 Discuss the new HPI E-Savage Baja TT body in our Body Shop forum.